The Antique Boat Museum collects, preserves, interprets and celebrates boats and related artifacts to advance public understanding of the importance of boating to the cultural history of North America and the St. Lawrence River in particular. In the 50 years since its founding the Museum has built up a substantial waterfront campus that encompasses 4.5 acres of public program space, 1900′ of dockage and 1300′ of St. Lawrence River shoreline. The 10 buildings on the campus contain 29,000 square feet of exhibit space and 33,000 square feet of public program, collections storage, archives, library and administration space. 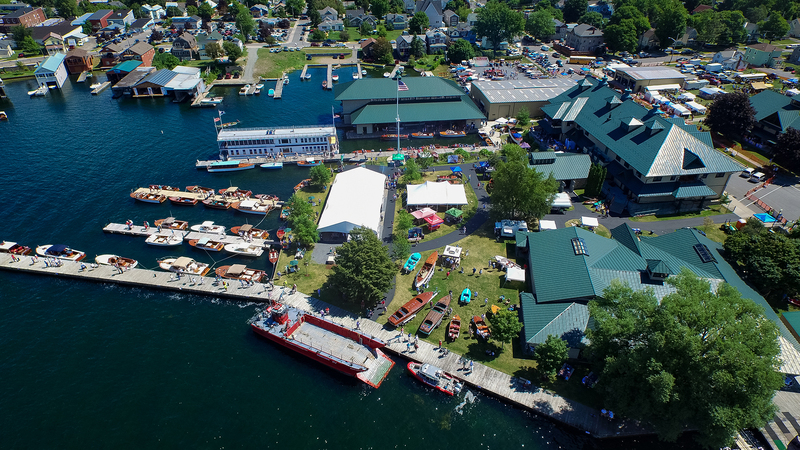 The exhibits and programs are supported by 20,000 square feet of boat collection storage located a short distance from the Museum’s main campus. In the last decade the Museum has undertaken a substantial capital expansion program to consolidate its real estate holdings and construct buildings and infrastructure worthy of its collection and programs.From humble beginnings as a riverside gathering of antique boat enthusiasts, the Antique Boat Museum has evolved into a national institution which makes substantial economic and cultural contributions to Clayton, the North Country region and the preservation of North America’s maritime heritage.